Purchasing a mountain bike can be a daunting process. With so many options, it can be difficult to know where to start. Many people wonder where to buy mountain bikes, when is the best time buy mountain bike and what's a good price of a mountain bike. To help make the process easier, here five things to avoid while buying a mountain bike. A mountain bike is all about performance, capability and personal preference. While an aesthetically pleasing bike is never a bad choice, it is hard to tell how a bike performs just by looking at it. Even sitting on the bike in the shop and toying around isn't enough to judge how the entire bike functions and operates. One of the biggest mistakes new buyers make is purchasing a mountain bike before taking a test ride. No reputable mountain bike shop should have a problem with a customer testing their bikes in the parking lot. This is the best way to see how the bike performs and the only way to tell if there are any kinks or issues that need to be solved. For online purchase, you can do a test ride on local shop and make purchase that mountain bike from online such as amazon or something that you trust. You can also buy without test ride in that case you need to read their refund or return policy carefully. Finding the perfect mountain bike can be a long and time-consuming process. The price, size, seat adjustment and overall design are all factors that have to match perfectly to an individual's preferences. This can lead a lot of people to settle for a mountain bike that isn't completely perfect. While this may not seem like a big deal in the beginning, it can have some negative consequences in the long run. First and foremost, even the smallest amount of discomfort on a mountain bike will become exponentially more painful the longer it is ridden. Furthermore, mountain bikes are meant to last for years and years. That is one aspect that justifies their high price. If a buyer settles on a bike that's not perfect, they could be stuck with it for a long time. It's much better to be patient and find a mountain bike that works. Many people tend to feel nervous or reluctant to ask questions when making a purchase. This can lead to uninformed decisions and later regret. Additionally, with the internet full of information and reliable websites, it can be easy for someone to feel confident about what they know about bikes. However, it is not a good idea to research a bike online and purchase it at the store without asking any questions. There could be slight differences between the advertised characteristics and the actual product. Furthermore, the professionals at the store may have some important information about the bike. Every customer should want to be as informed as possible before purchasing a mountain bike. For this reason, it is important to ask questions and learn more. When on a budget, it's tempting to simply buy the cheapest mountain bike. While this will help save money in the short term, it may actually require more investment in the long-run. Cheaper mountain bikes will break down more, fall apart easier and get older much quicker. The replacement parts and repairs will all cost extra money that could've been used to buy a more durable bike. The price of a mountain bike doesn't matter near as much as the quality and comfort. It is still possible to save money while getting a worthwhile bike. The best time buy mountain bike is when the perfect one has been found. In order to find the best mountain bike, it is necessary to visit more than one shop and test ride more than one bike. Unlike massive clothing stores, bike shops typically carry unique and specific models rather than everything under the sun. Exploring more shops will yield more options and a greater chance of finding the perfect bike. If one doesn't know where to buy mountain bikes nearby, they can check online to see. Mountain bikes are an investment that should be taken seriously. Although they are primarily used for fun and enjoyment, these bikes are a tad pricey and should be treated as such. 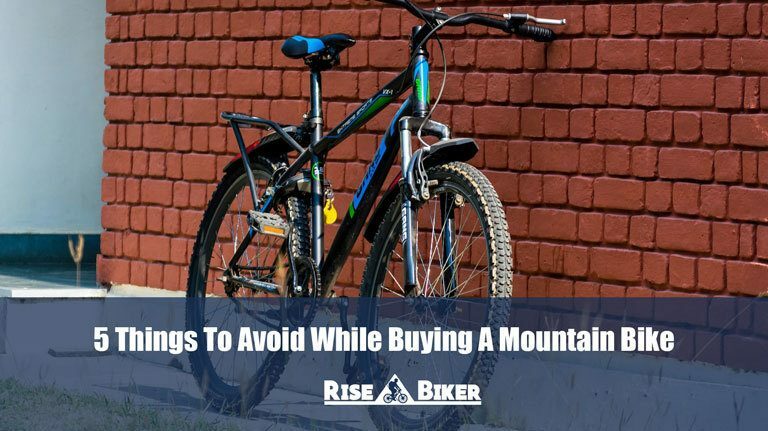 These things to avoid while buying a mountain bike can help someone in the process of buying a mountain bike.